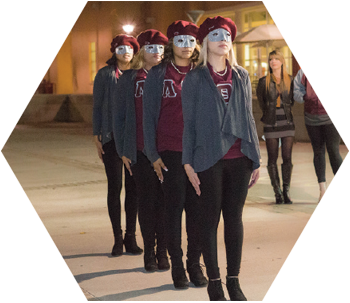 Intake is the membership selection process conducted by UNM’s multiculturally based sororities and fraternities. Many of these organizations are historically African American, Native American, Latino/Latina, or are built from other historically significant cultural roots, but you do not need to be from a certain background to join an organization. Each group’s intake process is difference, including when they take on new members. This process, known as “general intake” begins with an interest meeting, followed by a period of membership education. Member initiation is called “crossing” and is an often-public presentation where new members are recognized and unveiled to the University community. Please see the video below for an example of a new member showcase. MGC chapters pride themselves on unique cultural backgrounds, diversity, unity, and a commitment to academic achievement, political awareness, and service. Most organizations have smaller chapter sizes, ranging from 1-30. Most MGC organizations do not currently have chapter houses, but use many common spaces including the Residence Halls, the Student Union Building, and other areas across campus. If you’re interested in learning more about these organizations and their intake of new members, please contact the respective organizations or the Greek Life office, or fill out an interest form.